That was Mini Monkey about 10 minutes before the end of our first ever Parkrun. Parkrun has been on my list of things to do for a while now. With Mr MAP away for the weekend and having just purchased a double Croozer (running pram/cycle trailer) from Gumtree this week so I thought I'd give it a whirl. 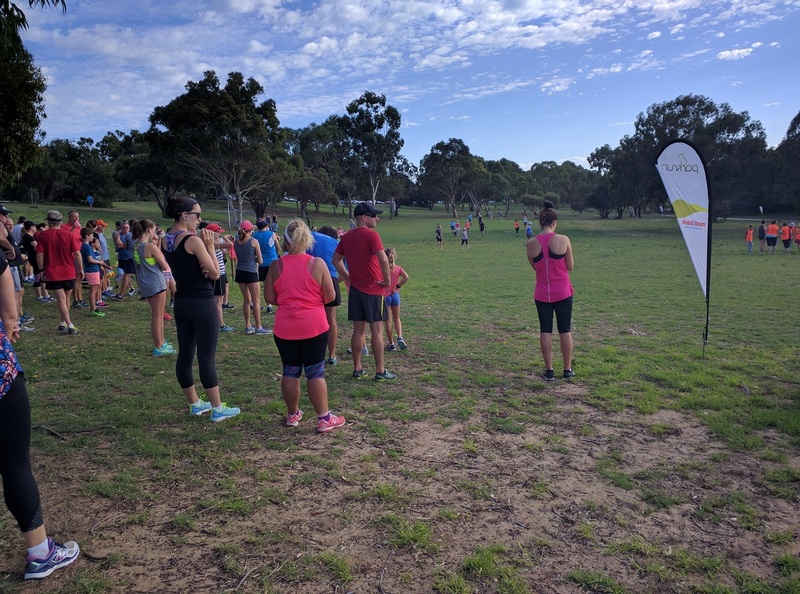 Having polled the Pram Runners Australia Facebook page for the most suitable courses, I decided we would take the 30 minute drive up to the Carine Glades Parkrun at Carine Open Space. The course is two by 2.5km laps, largely flat and has plenty of opportunity for overtaking/being overtaken, very important when you and your cargo are wider than a bus. The information on the website and the pre-race briefing were all very clear and easy to follow. With great sadness I read that you could bring a stroller and you could bring a dog but not both at the same time so Velcro dog couldn't join us this time. I deployed emergency snacks early as a distraction during the briefing to prevent the firstCroozer War. Unfortunately, this meant that I had nothing left toward the end of the run for the 'are we nearly there yet' phase. Mini Monkey started getting ansty and, in a bid to get more of my attention, started annoying The Giant Baby. The Giant Baby is getting to be very loud and better and better all the time a defending himself/retaliation and so The First Croozer War ensued. One lady I passed joked that I didn't need a bicycle bell to let people know we were coming. I tell you what, pushing a double stroller is hard work. That simple 5km felt almost as tough as some of the trail runs I have been doing (minus the killer hills). Add to that temperatures around 30 degrees and I was a sweaty mess on finishing. Carine Open Space has a nice playground so the boys had a run around whilst I had a cool down. It seemed a friendly space with lots of other families doing the same. 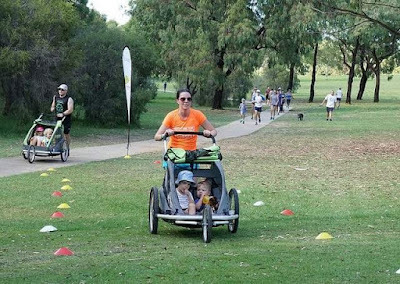 A dad who had done the Parkrun also with another double Croozer came and introduced himself as one of the advisers from the Pram Runners Australia forum. Opening Hours: Carine races are at 8am.